It turns out I’m not the only one around these parts with a weakness for American bacon. We’re having our house repainted at the moment, and today the painter was working inside to do the window frames. He spent 15 years living in America and only moved back about five years ago, and was chatting with us in the kitchen as I started to fry up the pancetta for this dish. “That’s not streaky bacon, is it?” he asked, streaky bacon being somewhat closer to American bacon than rashers, but still too thick cut to get as crispy as I like it to be. So he got the whole story of how much I’d missed bacon and then finding the pancetta at the grocery store. He told me how his oldest daughter prefers American bacon too, and how he’d have to get her some now that he knew about it. 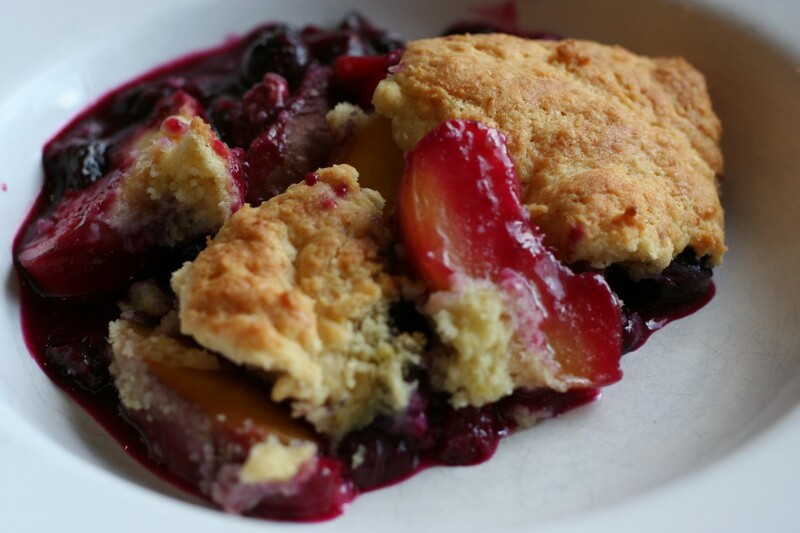 He was also eying up this cobbler as I made it and dropping hints about how good it looked, so he was pretty pleased when he was still around when it came out of the oven and I gave him some to have with his coffee. It’s true that carbonara isn’t for the calorie‐conscious, but even so, once you break it down per serving, there’s “only” one or two tablespoons of cream, one egg yolk, a couple tablespoons of cheese and a few slices of pancetta per serving, so for being a decadent dish, it’s not all that bad, though certainly not something you’d want to have every day. But as for the cobbler, there’s only two tablespoons of sugar in the entire dessert, making it the kind of treat I don’t at all mind giving my kids. Put a large pan of salted water on to boil. Halve and then quarter any larger courgettes lengthways. 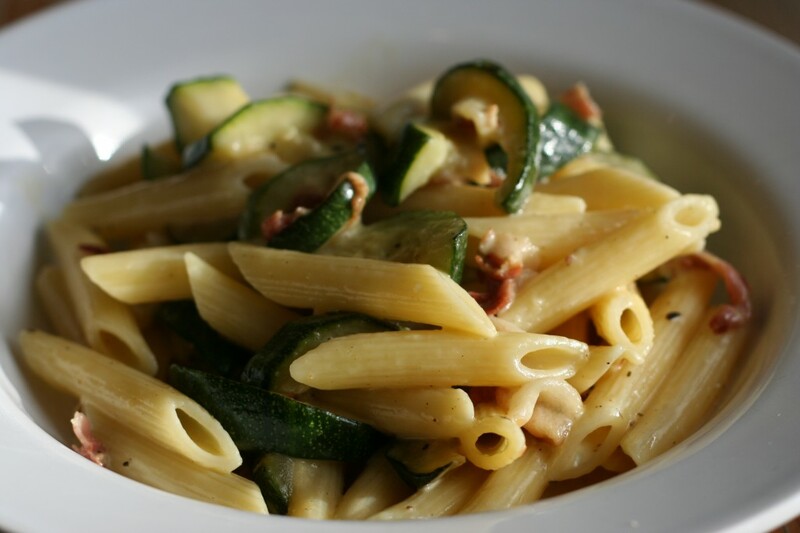 Cut out and discard any fluffy middle bits, and slice the courgettes at an angle into pieces roughly the same size and shape as the penne. Smaller courgettes can simply be sliced finely. When the water boils, add the penne to the pan and cook according to the packet instructions. To make the carbonara sauce, put the egg yolks into a bowl, add the cream and half the Parmesan, and mix together with a fork. Season lightly and put to one side. Heat a very large frying pan (one that will be able to hold all the sauce plus the pasta later on), add a good splash of olive oil and fry the pancetta or bacon until dark brown and crisp. Remove with a slotted spoon and to a plate lined with a paper towel to drain. Drain off all but 1 tablespoon or so of the bacon fat. Add the courgette slices and 2 big pinches of black pepper, not just to season but to give it a bit of a kick. Sprinkle in the thyme leaves, give everything a stir, so the courgettes become coated with all the lovely bacon‐flavoured oil, and fry until they start to turn lightly golden and have softened slightly. Crumble or chop the bacon and add it back to the pan. While you’re tossing the pasta and sauce, sprinkle in the rest of the Parmesan and a little more of the cooking water if needed, to give you a silky, shiny sauce. Taste quickly for seasoning. Serve and eat immediately, as the sauce can become thick and stodgy if left too long. For the cobbler crust, put the flour, salt, baking powder, sugar, lemon zest and butter in a food processor and blitz for a few seconds, until the mixture resembles breadcrumbs. Tip into a bowl and set aside. Put the sliced peaches and blueberries into an ovenproof dish. Toss them with the lemon juice, sugar and flour. Mix the sour cream into the crumb mixture to make a soft dough. Break off walnut‐sized pieces and flatten them lightly. Lay them on top of the fruit. Sprinkle the rounds of dough with sugar, then bake for 25 minutes, till the cobbler is golden and the fruit is bubbling. Serve with ice cream, a drizzle of cream or some warm custard.